TRILOK STEEL INDUSTRIES is one of the most trusted supplier & exporter of Stainless Steel Perforated Tube in a number of standard sizes and grades. Our stock of Stainless Steel Perforated Tube primarily consist of the austenitic grades of stainless steel including TP304, TP304L, TP316, TP316L, and TP201 in annealed and pickled, bright annealed, mill finish. Perforated Stainless Steel Tubing to support the filter media in making of various filter elements. Using of perforated metal adds more strength and pressure resistance in filter flow.Trilok Steel Industries is PED approved manufacturer & Govt. of India recognized Export House and an ISO 9001 : 2008 accredited company. Our offered Stainless Steel 304 Perforated Tubesare mostly used in filter products as support tubing, and sometimes it is used directly as filter tubes and cylinders for certain industries..We are also well known as Stainless Steel Perforated Tube Manufacturer in India. Buy stainless steel Perforated tubing at best price in India from us as compare to market price. As a largest stockholder of stainless steel Perforated Tube includes grades Stainless Steel 304L Perforated Tube,Stainless Steel 316 Perforated Tube,Stainless steel 316L Perforated Tube and Stainless Steel 201 Perforated Tubethose are used in various indutsrial applications. One of the most widely used general-purpose stainless steels. It possesses an excellent combination of strength, corrosion resistance and fabricates well. To reduce carbide precipitation when welding, use 304L for its lower-carbon content. Superior corrosion resistance compared to other 300 series alloys when used in used harsh corrosive environments (ex. sea water, chemicals, etc.). To reduce carbide precipitation when welding, use 316L for its lower-carbon content. Titanium stabilized stainless steel to prevent intergranular formation of chromium carbide. It exhibits strength characteristics superior to those of 304 stainless, thus making it best suited for parts which cannot be subsequently annealed. The lowest alloy content of the three general-purpose types. It is a heat-treatable chromium type used for highly stressed parts needing the combination of strength and corrosion resistance. The lowest chromium content of the stainless steels, 409 combines good elevated temperature corrosion resistance with medium strength, good formability, and overall cost. A general-purpose non-heat-treatable chromium type used for highly Perforated trim applications in mild atmospheres. Its strengths are in ductility, formability, good corrosion and oxidation resistance, thermal conductivity and finish quality. 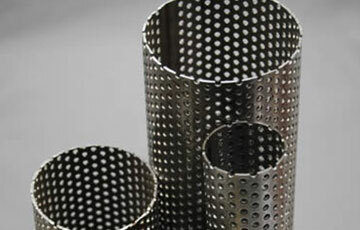 check latest updated price of stainless steel Perforated Tube. Stainless Steel Perforated Tube Manufacturer in India, SS Perforated Tubes, SS Perforated Tube Dealer in India, High Quality Stainless Steel Perforated Tube, Stainless Steel Perforated Tubes Exporter in India, Perforated Stainless Steel Tubing, Welded Stainless Steel Perforated Tubes. Suppliers of Stainless Steel Perforated Tubes, 304 Perforated Steel Tubes, Stainless Steel Perforated Tube Exporter, SS 304 Perforated Tube Importer, SS 316 Perforated Tube Supplier in Mumbai, India. Stainless steel Perforated Tubes are finished in accordance with customer needs regarding dimensional and wall thickness specifications as well as heat treatment for more demanding applications. In general a stainless steel Perforated Tube is manufactured according to current standards API, ASTM, and ASME. If required for special projects we can also supply large diameter Perforated Tubes.